Successfully Added Tactical Red Laser Gun Sight (Weaver Rail Mount, Dual Switch) to your Shopping Cart. Tactical Red Laser Gun Sight (Weaver Rail Mount, Dual Switch): Policemen, soldiers, and hunters: the perfect handgun accuracy accessory is here and ready to help you make that shot. This situation, common in many video games, can now become real with this convenient Tactical Red Laser Sight! Made of rugged aluminum and painted in glossy black color, this gun sight has been designed to be resistant, durable and fit most weapons with a weaver rail mount (such as shotguns, pistols and so on). Just fix the device right under the barrel and the red laser will guide your bullets to its target. This beautiful precision gadget also comes with two Allen wrenches to adjust with meticulous care the laser beam. To aim there are two choices: either use the constant switch (recommended for hunting) and turn the laser on/off by pressing it smoothly or install the tail line switch (recommended if you are hunted), stick it on the handle and turn the laser on as fast as thunder hits the ground when circumstances request it. 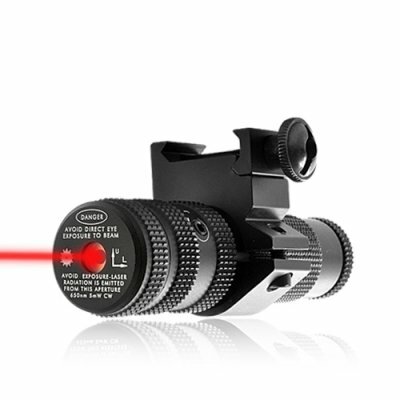 Some training coupled with this Tactical Red Laser Sight will help you improve quickly your accuracy and efficiency. From veteran soldiers to policemen to amateur hunters, equip your gun with this high accuracy Red Laser Sight to compete with the best sharpshooters! Brought to you at an amazing low price by the online leader in electronics and cool gadgets, Chinavasion. Great for laser alignment, aiming and positioning, hunting and spotting, search and rescue, outdoors and hiking. Never expose your eyes to the laser beam. on 2011-12-09 07:44:06 Outstanding quality and features!!! Bought this as a gift for my wife. The adjustment screws trimmed it in exactly on target for her pistol. The compact size and duration on the batteries is super. Best thing since smokeless powder!! !